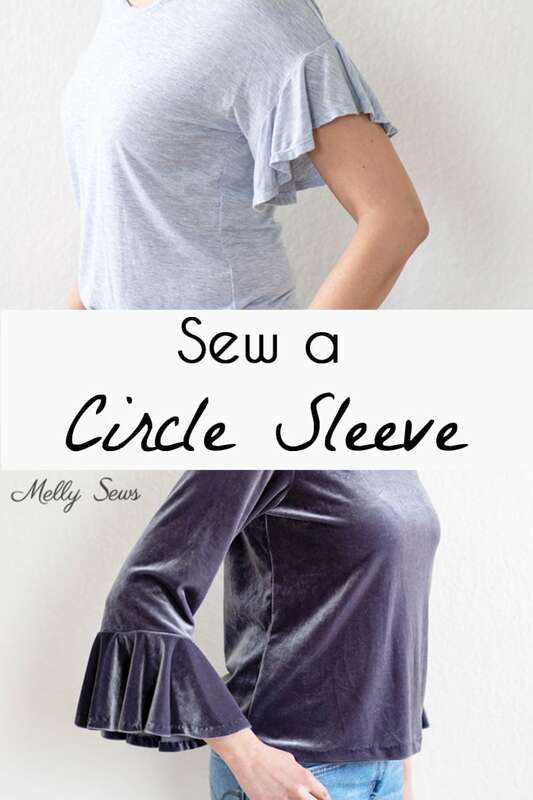 Learn how to sew a circle sleeve – this ruffled look is flirty and feminine. 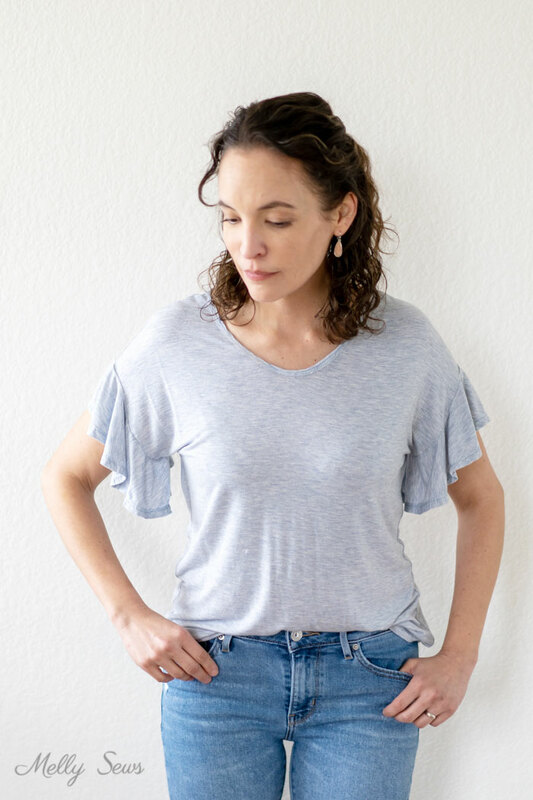 Hey y’all, ever since I posted the look below on Instagram I’ve been getting requests for a tutorial, so today I’m sharing how easy it is to add circle sleeves to a top. This top is the Blanc T-shirt but you can do this method on any shirt. 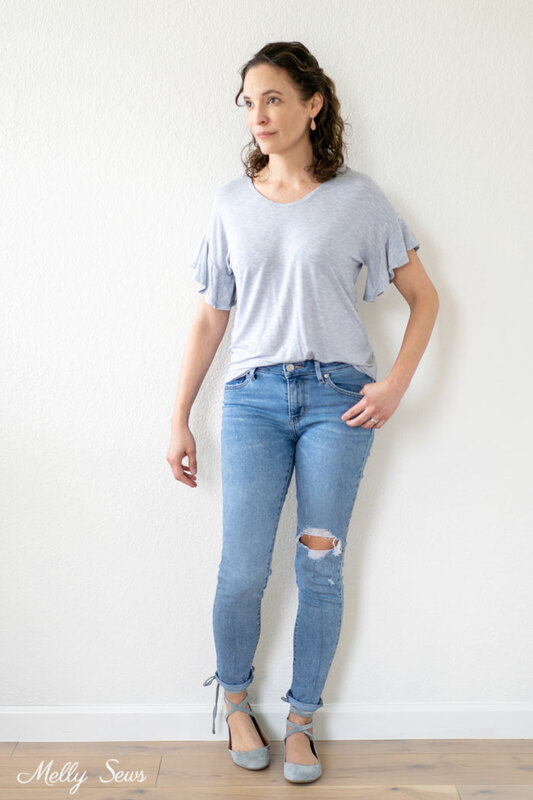 I love how the ruffle adds a little flirty and romantic feel to an otherwise very basic t-shirt. This one is sewn in a drapey rayon blend knit. 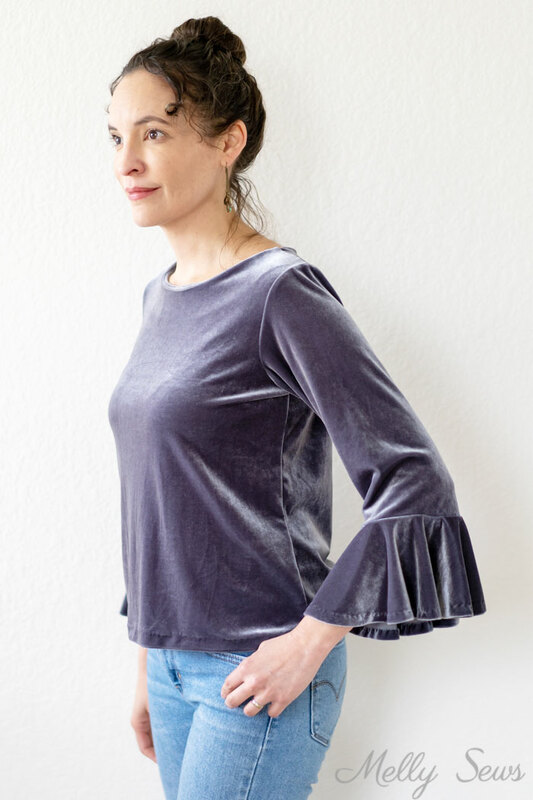 I also added circle ruffles to the sleeves of a stretch velvet Shoreline Boatneck for the holidays and beyond. At the ends of elbow length sleeves, these circles give the otherwise minimal lines of the shirt a little bit of a dramatic flair. 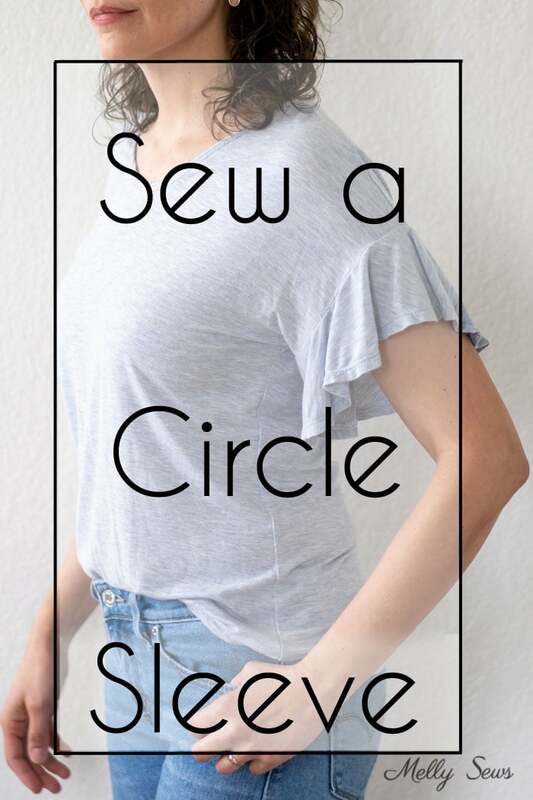 Really, this is just a variation on how you sew a circle skirt, and you could do this finish on a knit or woven top. Since the Shoreline Boatneck works in woven fabrics, that might be a good one to use – maybe in a rayon challis? I made a video tutorial of sewing the velvet version of this top, which you can watch below or on YouTube here. I’ve also got a written summary of the steps below the video. 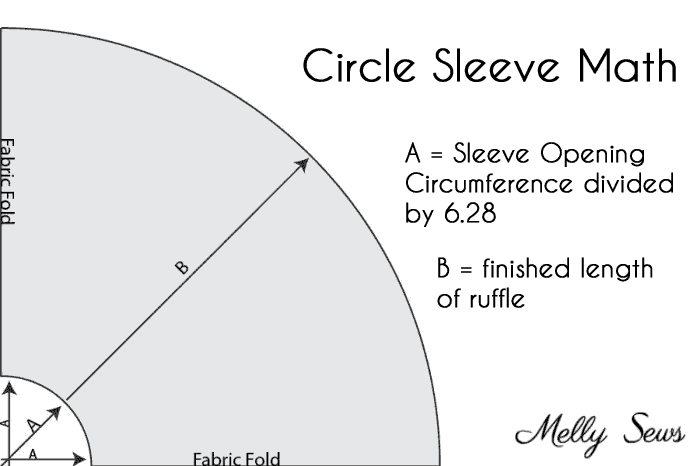 Determine the circumference of your sleeve edge where you want to attach the ruffle by measuring. Determine your desired ruffle length. On the blue Blanc shirt I used 3 inches, on the velvet Shoreline I did 5 inches. Measure that down from the arc you marked. Fold your fabric once on the grainline and once on the crossgrain, so you have 4 layers of fabric. Line up your pattern so both straight edges are on folds with the folded corner aligned in the “donut hole” you’re going to cut out. Cut fabric. 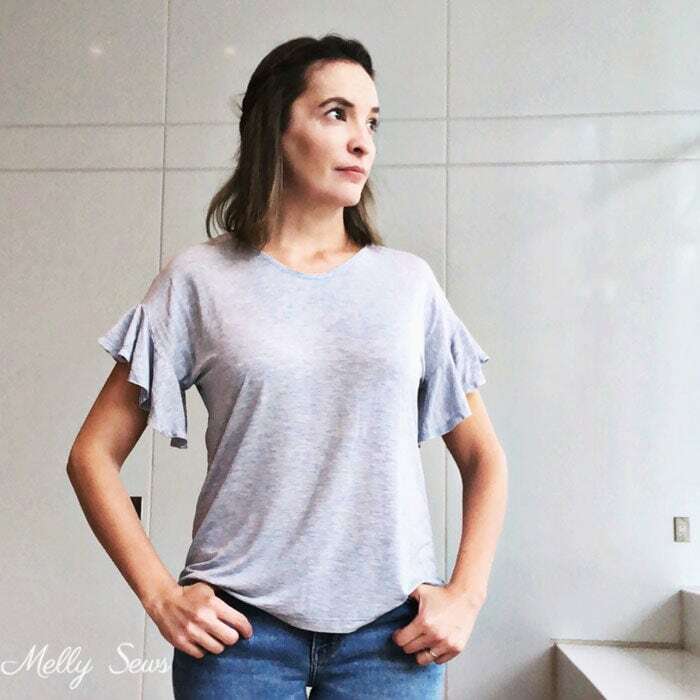 Hem sleeve ruffles – see the video for tips. Attach ruffle to end of sleeve and finish seam if necessary. Your ballet flats in the short sleeve picture are so pretty! I love these shirts, and they are everywhere to buy. But I was too lazy to figure it out…so thanks for doing the hard work for me! Thank you Melly. This is so easy and makes the sleeve beautiful.